With a stay at Palas Alacati - Adults Only in Cesme (Tokoglu), you'll be within a 10-minute drive of Aqua Toy City and Ilica Beach. This hotel is 0.2 mi (0.3 km) from Alaçatı Çarşı and 0.4 mi (0.7 km) from Pazaryeri Mosque. Enjoy Mediterranean cuisine at Mitu, one of the hotel's 2 restaurants, or stay in and take advantage of the room service (during limited hours). Snacks are also available at the coffee shop/café. Relax with your favorite drink at the bar/lounge or the poolside bar. A complimentary full breakfast is served daily from 8 AM to noon. For your convenience, a complimentary breakfast is served daily from 9 AM to noon. With the appearance and feel of a large summer house, this 10 room boutique hotel has been featured in many Turkish lifestyle magazines, including Maria Claire Maison. It has a modern aesthetic and is tastefully furnished in cool, relaxing neutral tones. A spacious garden provides an outdoor pool with decking for sun-bathing while clipped lawns invite bare feet and stretching out with a book. An inviting terrace where a meal or drink may be enjoyed, provides shade and a lovely view over the garden. The centre of Alacati is 600m away and this is where one, narrow street hosts a number of small, select shops and cafe bars which come alive at night. The resort and port of Cesme is 9 km away and can be easily reached by public transport which runs 400m from the hotel. For beach lovers Ilica Beach is just over 3 km away and there are many beach clubs and wind-surfing centres around the coast. Make yourself at home in one of the 10 air-conditioned rooms featuring LCD televisions. Your Select Comfort bed comes with premium bedding. Complimentary wired and wireless Internet access keeps you connected, and satellite programming provides entertainment. Private bathrooms with bathtubs or showers feature rainfall showerheads and complimentary toiletries. Enjoy a satisfying meal at Pupil serving guests of Alacati Pupil Hotel. Wrap up your day with a drink at the bar/lounge. A complimentary full breakfast is served daily from 9 AM to noon. Make yourself at home in one of the 20 air-conditioned rooms featuring minibars and LCD televisions. Rooms have private furnished balconies. Complimentary wireless Internet access keeps you connected, and satellite programming is available for your entertainment. Bathrooms have showers and hair dryers. Satisfy your appetite at the hotel's coffee shop/café, or stay in and take advantage of the 24-hour room service. Quench your thirst with your favorite drink at the poolside bar. With a stay at Hay Hotel - Adult Only in Cesme (Hacımemiş), you'll be within a 10-minute drive of Aqua Toy City and Ilica Beach. This romantic hotel is 2.9 mi (4.7 km) from Alacati Marina and 5.5 mi (8.9 km) from Ayios Haralambos Church. 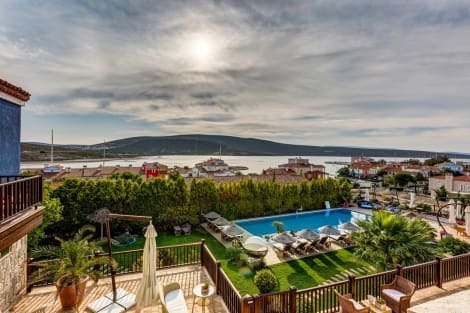 The hotel is located approximately 800 m to the east of the centre of the village of Alacati, within easy walking distance of the pretty streets and quaint houses which this village is famous for. Alacati marina is approximately 3.2 km from the hotel and the resort of Cesme 11.5 km, while Ilica beach is 3.5 km away. A charming boutique hotel consisting of 20 rooms, individually styled and furnished with pieces from Indonesia, Morocco and Italy. The outdoor pool area and bar has a Moroccan feel with touches of local influence and is an ideal place to relax and enjoy a sunset cocktail. lastminute.com has a fantastic range of hotels in Alacati, with everything from cheap hotels to luxurious five star accommodation available. We like to live up to our last minute name so remember you can book any one of our excellent Alacati hotels up until midnight and stay the same night.